Based in South-East Victoria, our customer’s core activity is the extraction and provision of granite based aggregates. In the winter months when conditions become wet with the usual seasonal weather, the quarried material was not effectively being scraped off the return belt by the existing primary and secondary belt cleaners. The problem was significant because as the clogged sticky material passed through both the primary and secondary cleaners, these conventional rigid blade cleaners were working twice as hard and wearing prematurely. The bumpy movement of the excess wet residue created too much contact with the cleaner blades and they were causing damage to the belt also. 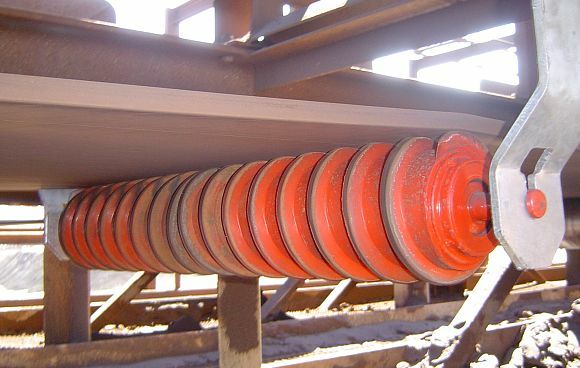 Because the Quarry Manager had used K-Spiral Cleaning Rollers at a previous site, he already had experienced the benefits of this wear resistant polyurethane cleaning idler. So he did not hesitate in ordering it again. The K-Spiral Cleaning Roller offers a low maintenance solution to belt cleaning, with sticky carry back cleaned off easily by the belt friendly polyurethane spirals. It can be used in both dry and wet applications. Ideally it is positioned over the discharge chute or a collection hopper so that the excess conveyed material can be cleared away simply, requiring no extra labour. This cleaning idler has now been in production at this site for 4 years and is showing no signs of wear. It has reliably dealt effectively with the clogged material on the return belt, providing extra back-up cleaning during periods of wet weather. In the drier months, the K-Spiral Cleaning Roller stays in place, acting as a standard idler on the return belt.